The virtual lid is about to explode off the ketchup bottle and a multitude of flavor blends will be trending, much like its condiment counterparts – mustard, mayonnaise and hot sauce. Ketchup originated from ke-tsiap, a pickled-fish condiment in 17th century China that eventually evolved to a tomato-based blend created by late 1700s New Englanders. From its beginning, ketchup blended with ingredients from mushrooms to exotic spices was common and often an indicator of the flavors of the region. In recent history, the ketchup standard has become somewhat uniform; a familiar staple in kitchens across the nation. We are here to tell you, times are a changin’. The virtual lid is about to explode off the ketchup bottle and a multitude of flavor blends will be trending, much like its condiment counterparts – mustard, mayonnaise and hot sauce. What does a new ketchup blend consist of? The possibilities are numerous and make it a wow experience customers crave. Spicy ketchups are easily made with chipotle, jalapeños, or by adding a tangy barbeque sauce. These additions are simple and produce a big impact on the plate when served with fries and a traditional sandwich or burger. Experimenting with sweet ketchups could lead to tasty creations such as raspberry or cherry ketchup, possibly served with sweet potato fries. A simple addition of a few new ingredients like fresh minced garlic, horseradish, or hot sauce can add a new level of dipping enjoyment for consumers. Imagine a plate with small ramekins of variations of ketchup in a clock formation, ranging from sweet to spicy depending on the added ingredients. Pairing food with ranges on the “ketchup clock” provide a unique, gourmet experience with a common condiment. Another trend in ketchup creation is to include larger add-ins such as roasted beets, sautéed zucchini, mushrooms, water chestnuts, or even nuts to add richness to a condiment dip or topping. Imagine a juicy burger with a zucchini ketchup topper…yum! Any idea to combine the familiarity of a dish with a simple little twist is the difference between ordinary and extraordinary. For bacon lovers, why not mix a little bacon, spices, and ketchup to serve with waffle fries? The buttery, sweet texture of pine nuts could pair with cilantro ketchup and be served alongside a host of menu items. One great combination that could lead to another idea to keep the dishes exciting for guests. A recent study of consumer flavor trends indicates that two in five people say they are willing to spend more on meals that showcase new and interesting flavors, which suggests operators have substantial room to experiment. Of course, Foothill Farms has a few easy ways to zip up ketchup with products that have been popular for kitchens and guests alike. Adding a dry mix to ketchup is a reliably delicious way to stay up-to-date with the trends customers will be looking for in the near future. And operators can compete for traffic by positioning themselves as offering an upscale experience at an affordable price. Redefining ketchup could easily redefine the popularity of any foodservice menu. We are offering a money-saving rebate for 24 of our sauce mixes. This covers everything from cheese sauce to bourbon sauce to stir fry sauce to cream soup base. Operators receive a $5 rebate per case (up to $200). Today, foodservice professionals feel the pains from a variety of factors facing the foodservice industry. Some of those culprits include: inefficient employee training and skill levels, rising labor and food costs, time management (prep time), food safety regulations, special dietary restrictions, and food consistency goals. One solution to help in these areas is the introduction of dry mixes, especially sauce mixes. The prep is simple – pour hot water in a bowl, start stirring with a wire whisk and gradually add mix until completely smooth. In fact, here is a new cheese sauce mixing video. If you haven’t tried a dry sauce mix, we can tell you that it is a no-nonsense approach to reaching your efficiency, quality and consistency goals. Beginning this May, we are offering a money-saving rebate for 24 of our sauce mixes. This covers everything from cheese sauce to bourbon sauce to stir fry sauce to cream soup base. Operators will receive a $5 rebate per case (up to $200) and the promotion runs through September 30, 2015. Please visit our website for more details on the promotion and a list of applicable sauce mixes. The downloadable form can be found here. Predicted foodservice trends tell us that consumers want healthier foods and fast. 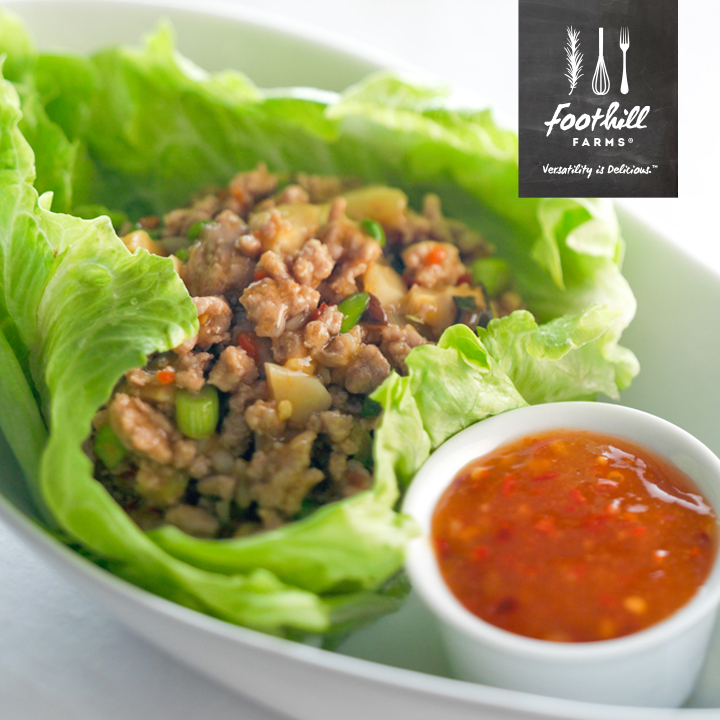 One product that can help chefs satisfy consumer demand is dry salad dressing mix. Dry salad dressing mixes like Ranch, Caesar, 1000 Island and Lido Italian are not just for green salads. Mixes can be used to make robust marinades, gourmet dipping sauces for appetizers, savory spreads for sandwiches, flavor enhancers for potato dishes, and delicate sauces for fruits and melons. Currently, we are offering a rebate for our Ranch Salad Dressing mixes (V400, V402). The promotion goes through May 31 and offers operators a $2 rebate per case (up to $200) on Ranch Dressing Mix products, plus a FREE first case of Blue Cheese, Lido Italian, 1000 Island/Honey Mustard, and Caesar Dressing Mix when you complete the rebate coupon. If you haven’t tried our V400 Ranch Dressing Mix or our V402 No MSG Ranch Dressing Mix, please leave your contact information below and we’ll send you a sample. This money-saving offer is available to foodservice operators in the U.S. only. Please visit our webpage for more details on the promotion. The downloadable form can be found at http://doclibrary.com/MFR457/DOC/FoothillFarmsDressingRebate20155452.pdf. Millennials are one of the most sought-after consumers due to their spending power. A millennial blogger shares her knowledge and offers sales and marketing strategies to help brands reach this generation most effectively. First of all, what is a millennial? This generation is comprised of 20 and 30-somethings born during the 1980’s and 90’s. They are one of the largest demographic groups since Baby Boomers. It is reported in a UNC Kenan-Flagler Business School journal article that 36% of the current workforce are millennials and that this population segment is expected to grow to 46% by the year 2020. The foodservice industry needs to find more ways to stay connected and attract this generation. As a fellow millennial, I know something about what it takes to grab their attention. Here are four strategies of how foodservice can appeal to our critical generation. To start off, brands need to think of what millennials do day-to-day. We are always on social media. All day, every day, we have easy access to brands, which is very important to us. It’s key for a brand to have a social presence, such as Twitter, YouTube and/or Instagram, if you want us to give any consideration to buying your product. Next, a brand must have a responsive web site; it must be mobile-friendly. We use our cell phones to look everything up rather than a computer. Accessing information easily is what millennials are all about. Third, a key to advertising and reaching millennials is having someone of similar age do the talking. We like to hear from our own generation because we can relate to them: we have similar interests, viewpoints, and are more likely to trust what they are saying. But what if you are not a millennial? I have a suggestion to overcome this. Remember, we like to do things differently from other generations. Embrace modern methods of communication that are second nature to us like text messaging, video chat, or even email rather than a phone call. If you communicate in a way that is most comfortable to me, you’re more likely to earn a repeat customer because you put me at ease and you get me. Lastly, when opening a menu what’s the first thing you notice? The picture! It’s the first thing that everyone notices; millennials like things with a modern, clean design not drab and old. Think about this when designing menus, logos or showing us sales information. Does your brand image need to be updated? 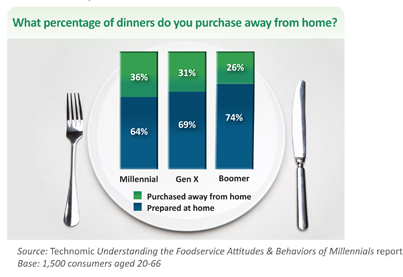 Technomic reports that Millennials dine out the most when compared to Gen X’s and Boomers. Technomic’s article, “Understanding the Foodservice Attitudes and Behaviors of Millennials”, emphasizes the size, spending power and high foodservice patronage of this generation when compared to any other generational group. Millennials like information, the challenge is getting the information to appeal to us. We are a generation shaped by technology. And we are influencers. Hailey is a college student from Missouri. She just finished her first semester and plans on a career in health or business. We asked her, as a Millennial, to provide perspective on what is important to them and how to be successful in selling to this generation. If you have a question for Hailey, leave a reply below.